Monday June 23rd 1890 We worked in the yard and garden some in the morning. Mother then went to town to help Hattie put up fruit. I fixed an old dress of mine for Winnie and began work on one for Mother. The men are plowing corn. Tuesday June 24th 1890 I worked out in the yard with Winnie the greater part of the forenoon she went to town for meat. I finished Mother's dress in the afternoon and done a little more work in the yard. Lee went back to Burlington today. Mother came home tonight. 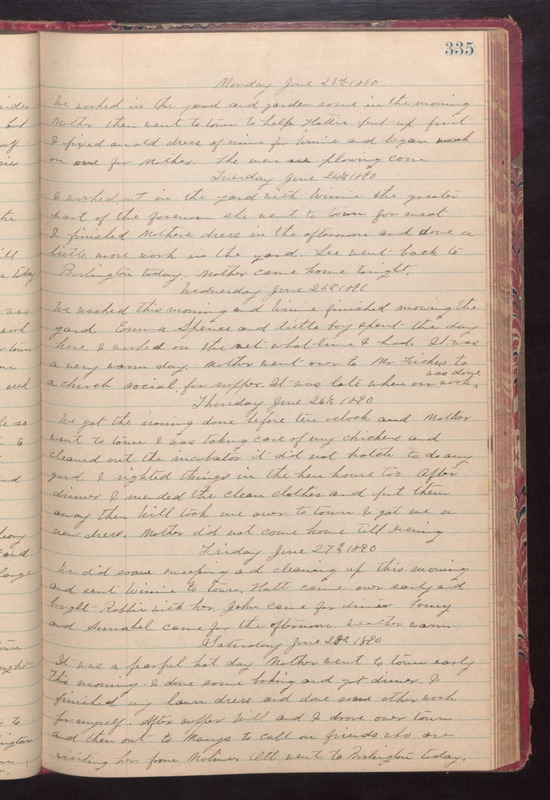 Wednesday Juner 25th 1890 We washed this morning and Winnie finished mowing the yard. Emma Spence and little boy spent the day here. I worked on the net what time I had. It was a very warm day. Mother went over to Mr. Friches to a church social for supper. It was late when our work was done. Thursday June 26th 1890 We got the ironing done before ten oclock and Mother went to town. I was taking care of my chickens and cleaned out the incubator it did not hatch to do any good. I righted things in the hen house too. After dinner I mended the clean clothes and put them away then Will took me over to town. I got me a new dress. Mother did not come home till evening. Friday June 27th 1890 We did some sweeping and cleaning up this morning and sent Winnie to town. Hatt came over early and brought Robbie with her. John came for dinner. Fanny and Annabel came for the afternoon. weather warm. Saturday June 28th 1890 It was a fearful hot day. Mother went to town early this morning. I done some baking and got dinner. I finished my lawn dress and done some other work. for myself. After supper Will and I driove over town and then out to Marys to call on freidns who are visiting her form Moline. Ott went to Burlington today.